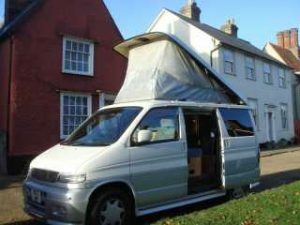 08/04/19 Non-Member Sale: 2.5l V6 dual petrol/gas Mazda Bongo/Ford Freda,1998, 85,00 miles. UK registration 2008. MOT until Oct 2019. JAL conversion with full length electric lifting roof, fitted roof mattress, side kitchen with gas hob, sink, fridge, water and electric hook-up, leisure battery, side awning, portapotty. Good condition, full service history.